Like the last few months, November went quick. It’s now less than a month from Christmas. Personally, my November was very busy. I’ve worked a lot of overtime. But I was rewarded by having my position made permanent, instead of being on a contract. I also decided to get a new car, and spent some time looking around. I am hoping to pick one up by the end of this week, if all goes well. The blog surpassed a few more follower milestones. There are now well over 900 followers via GFC alone. And I’m sure you saw a bunch of blogs posting about GFC changes. That will not affect Workaday Reads since I am hosted by Blogger. And very happily so. I have no challenges left that end in 2011. The In Death challenge is perpetual, and the Canadian Book challenge goes until June 30, 2012. 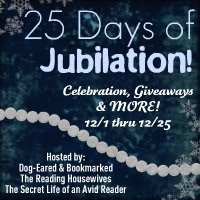 – The 25 Days of Jubilation blog tour will be making a presence here on Dec 19. I will be talking about my favourite books of the year, and offering a great giveaway. – I have at least one other giveaway going on during the month. – I will announce the reading challenges I will be participating in. – There will be several authors stopping by with interviews and guest posts. – And of course, there will be book reviews. Congrats on landing the permanent position! Happy December reading! Congratulations on your permanent position, that is a weight of your mind I am sure!